The S/5 Aespire marks the introduction of the new AdvancedBreathing System, the ABS™. Its design, based on your needs, is fully integrated into the workstation. Fewer parts and connections reduce the potential for leaks and misconnects, providing greater patient safety. Multi Absorber* canister facilitates fast, easy removal and replacement. Fully autoclavable, integrated electronics detect complete engagement or disengagement of the ABS. One step mechanical bag to vent switch requires no electronics. 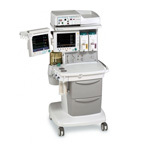 Soma Technology offers two different ventilator options in the GE Datex Ohmeda S/5 Anesthesia Machine. The GE Aespire can either have a 7100 ventilator or a 7900 ventilator. Both of these ventilators are microprocessor based, electronically-control, and pneumatically-driven. The S/5 Aespire’s ventilators have built-in monitoring for inspired oxygen, airway pressure, and exhaled volume. These ventilators are designed to be used to aid in the delivery of anesthesia and is part of the GE Datex Ohmeda S/5 Aespire anesthesia machine. Dual redundant airway overpressure protection. Volume over-delivery limits and protection. Proprietary hose connections and fixed manifolds. 10 VA electrical power limiting to potential oxygen enriched environment. 150 psi burst overpressure protection. The 7100 ventilator is accompanied by a Ventilator Monitoring Board (VMB) which serves as the interface between the ventilators control board and the breathing system sensors and switches. It passes different switch functions through to the ventilator control module and provides power to the task light. Respiratory gas flow, to and from the patient, is monitored by measuring the differential pressure across a variable orifice in each flow sensor. The pressure transducers measure the differential pressure on the VMB. The 7900 ventilator is equipped with an Enhanced Sensor Interface Board (ESIB) which is located under the tabletop. The ESIB serves as the interface between the ventilator CPU board and the breathing circuit sensors and several machine switches. It passes through various switch positions to the ventilator CPU board and provides an interface for the ACGO switch, the Bag/Vent switch, the canister release switch, control panel cover switch, CO2 bypass switch, and breathing circuit ID switches. Both the 7100 and the 7900 ventilators on the S/5 Aespire have a sealed lead acid battery that is only used as back up power in case of power failure. The batteries will power each unit for about 30 minutes. Power up is quick and easy in your fast-paced environment. Minimum 02 flow of 50 mL available with dual flow tubes, ensures accuracy in low flow situations. Enhanced hose and cable management reduces disconnects and clutter. Lightweight and compact for easy maneuverability. Larger work surface for supplies and chart. Two large drawers provide more storage. Removable drawer insert conveniently stores small items. Smooth, durable surfaces for cleaning ease. Only one scheduled maintenance check per year. Tec® 7 vaporizers are planned factory service free. Utilizing the proven performance of the 7100 ventilator, the S/5 Aespire helps provide highly effective ventilation for standard. The bellows provides a quick visual reference of the patient’s breathing stability. The intuitive user interface allows constant visual confirmation of function. Software is easily upgraded utilizing innovative memory sticks, so you can choose the ventilation capabilities you need. Standard software includes Volume Control ventilation, integrated volume and oxygen monitoring, electronic PEEP and alarm management, important for every case. Optional capabilities include Pressure Mode, pressure waveform and tidal volume compensation. Optional suction control eliminates need for stand alone suction. Optional auxiliary O2 supplies a pure oxygen source for use with a nasal cannula. LED light strip provides bi-level work surface illumination. Auxiliary Common Gas Outlet facilitates low pressure leak test. High quality pneumatic flow mixing.